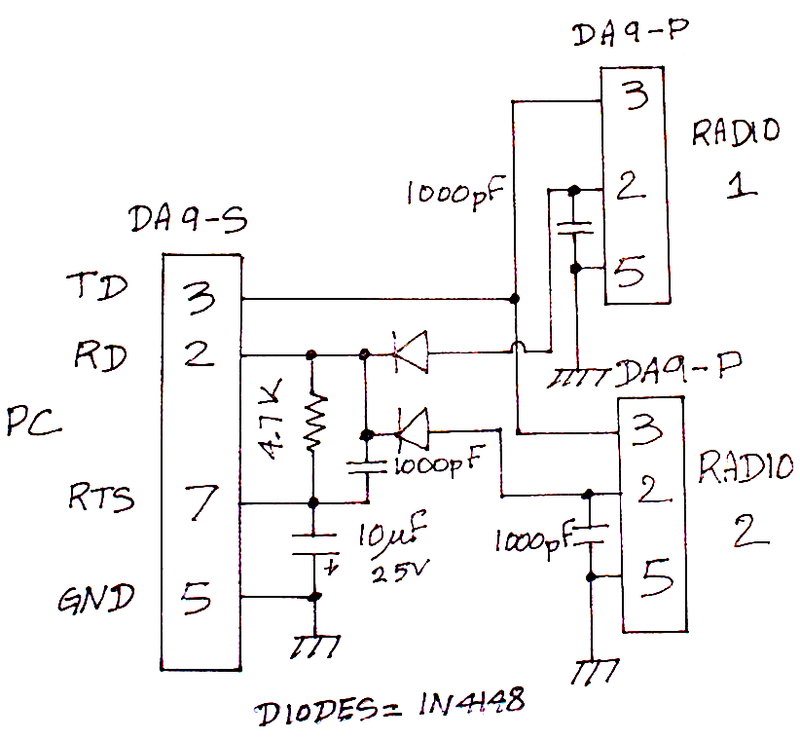 Here is the schematic of the simple interface I use between my Hitachi laptop and my FT-1000 Mk5 Field and FT-817 transceivers. This project was inspired by a recent QST article for a similar interface in an old mouse. It turns out the older square Logitec mouse is just wide enough for 2 9 pin ITT-Cannon connectors of the type used for serial ports. 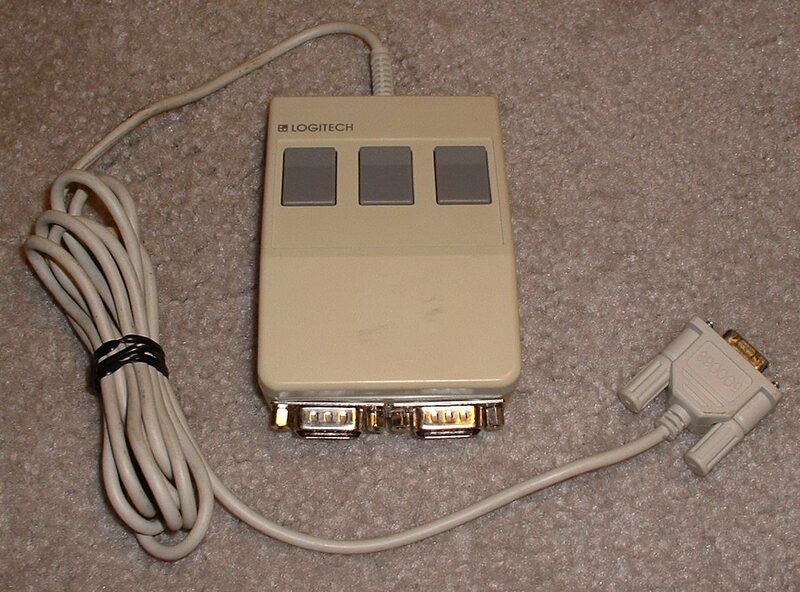 My laptop has a single serial port, does not have USB interface and has an older 16 bits PCMCIA socket, for which I have not found PC Card-USB adapters, so I had to find a way to control both radios with a single port, and I did not want a manual switch box with yet another knob (or another wall-wart for that matter, so it had to be self-powered too). This interface has been designed for use with Logger32 and may not work with other logging software, or radios. Because of the way N1MMLogger uses the serial port in a two radio configuration (SO2R), this interface will not work with N1MMLogger, or at least not in a SO2R configuration. Please note this device breaks absolutely all rules of good design and is absolutely not guaranteed to work, even if you had the very same setup. This interface is very simple and relies on using different baud rates for the 2 radios so that there are no interactions. I use 9600 baud for the FT-817 and 4800 bauds for the FT-1000. I was able to use the cable that came with the mouse, even though the RTS and DTR pins are tied together inside the connector. The radios both get the commands from the computer, and the radio that has the proper command syntax and baud rate sends a response. With this interface, make sure you set your logging software to apply a continuous low voltage on the RTS pin (-7 to 12V typically). If you use the same mouse cable, or if your cable also ties RTS and DTR together, make sure you set the logging software to set both pins to the same level. Depending on the voltage and current capability of the various serial ports, you may need to increase the 4.7kohm resistor. Please note the FT-817 does not have a native RS-232 port (the standard interface delivers TTL levels), so this interface expects a CAT interface or similar between itself and the transceiver. I could have built the CAT interface inside the mouse, but I wanted to be able to use the interface with any radio, not just the FT-817. As usual, just because it works for me does not guarantee it will work for you. Use at your own risk.